This lesson steps you through locating, evaluating and installing a contributed project from Drupal.org. In this lesson we use a concrete use case: translating your content to Pirate speak! This lesson will help you learn how to find what you need on Drupal.org, evaluate what you find and download and install the module. Go to the Drupal.org module section and find the contributed (contrib) module that meets the use case in the overview above. From the identified module's project page, find the Downloads section. 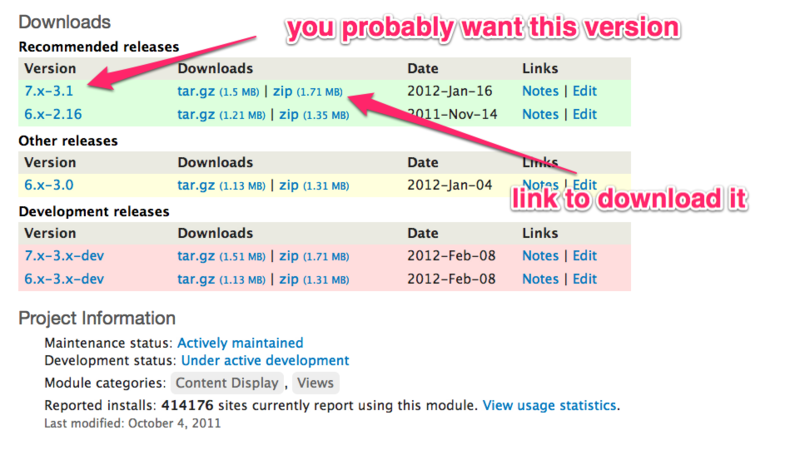 Click on the .tar.gz or .zip link to download the module. You should see a list of files extracted into a folder. Copy to your Drupal site folder. The modules folder at the top level of your Drupal installation is reserved for Drupal core modules (the ones that come with the original download of Drupal). Contributed modules belong in sites/all/modules. Copy or move the extracted module folder to this folder. Read the directions. If the module has an installation file (usually INSTALL.txt and/or README.txt), read it for specific instructions. There are modules that require special treatment, and even modules that depend on other downloaded files to function properly. Sometimes the README file has no .txt extension. If you double-click it, your computer won't know what program to use. In that case, open a text editor first, and then open the file using the editor's 'file open' command. Enable the module. Navigate to Administer > Modules or http://example.com/admin/modules. Check the 'Enabled' box next to the module and then click the 'Save Configuration' button at the bottom. Note: If you are updating an existing module, you'll need to click 'update script' at the top of the page or load http://www.example.com/update.php, then click 'Continue' (after making a backup of both your database and 'sites' folder). Set up permissions. Some modules will require that you change permissions to get them working. Permissions information may be in the instructions that came with the module. Navigate to Administer > Modules and click on the 'Permissions' button for the desired module. You can also do this on the Permissions page (Administer > People > Permissions). Scroll down to see if the module appears in the list and, if it does, give the appropriate permissions to desired roles. Adjust settings. Most modules will have some type of settings page. It will vary from module to module but if not described in the README.txt file, it can usually be located by navigating to (Administer > Modules) and clicking on the 'Configure' link for that module. Not all modules have settings pages. For contributed theme's the process above is very similar. Where it differs is the location to find themes and where to enable the theme (http://www.example.com/admin/appearance). The "Dialectic" pirate speak module has no README file in the download. Great example, but may not be the best for illustrating potential compatibility issues or requirements to new users.